Twitter began to roll out a new interface on Thursday that the company promises will simplify the site and make the web design more consistent with the company’s popular mobile apps. We’ve seen the company testing new Twitter features for a month or so now, and the redesign is finally here. What's new in Twitter’s latest version and when should you expect to see it in your browser? The new look of Twitter. Twitter has redesigned almost every section of Twitter with the new update. The traditional Home page has been updated to automatically provide a wealth of new information. In addition to the usual scroll of new tweets, the page now automatically shows you your user information in an easy-to-read format. Rather than popping out to the side when you expand a tweet to see a linked photo or video, tweets now push down the rest of the scroll so no information gets covered up. The site has also radically redesigned your Twitter profile page as the Me Page. The Me Page is no longer just the place where you update your personal information. It now also acts as a storing house for your direct messages. Finally, Twitter has added a new Connect page that make it easier to find new users using the company’s @username formula, as well as a new Discover page that makes it simple to find new topics of interest by following new hashtag topics like #twitterredesign. Twitter is also updating its mobile website and mobile apps to conform to the new redesign, bringing the Twitter website and its mobile interface in line for the first time. This should make it a lot easier for users getting started with the service to figure out how to use it when they’re on the go. 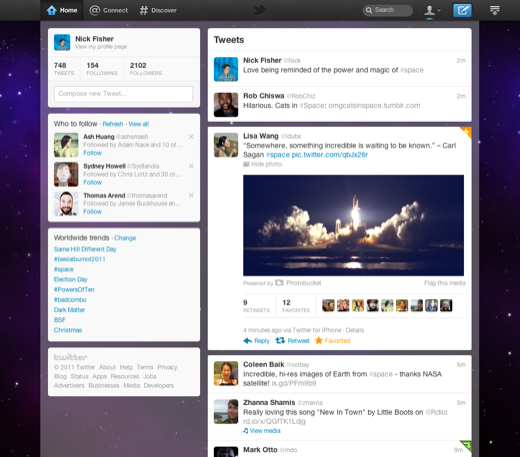 Twitter first started rolling out its last redesign in September of 2010. For that release, users got the option to switch to the new Twitter design in a few weeks with a mandatory switch to the new layout following after a few months. The new redesign seems to be following that formula to the letter, but if you want to take a peek at what you can expect right now, point your browser to Twitter’s mobile site, which already sports the new interface. Or you can check out the company’s new page that explains all the features in the new Twitter design. What do you think of the new Twitter? Are you excited about the changes or is the second redesign in a little over a year--or is it too much too fast? Let us know on Facebook and, well, on Twitter.